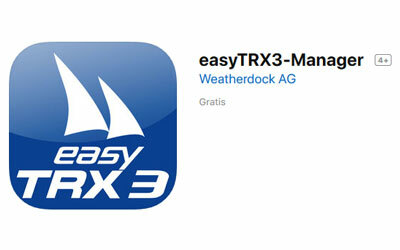 The easyTRX3-Manager app for all smartphones and tablets is available now for free in the App Store of Apple and at the Google Play Store. With the app all settings of the easyTRX3 can be done. Both, the determination of the static data, such as MMSI, name, call sign and type of ship as well as the configuration of the numerous interfaces (USB, NMEA0183, NMEA2000) can be made easily via the app. In addition, anchor and CPA alarms can be turned on and off.